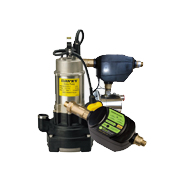 This submersible pump is suitable for double storey homes, to connect to toilet(s) and laundry. This model has the pump submersed inside the tank to minimise noise. 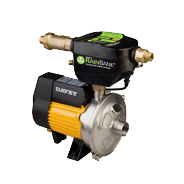 The Rainbank can be mounted on a wall outside the tank. D53 Submersible pump is a 3 stage, high quality, dependable stainless steel and plastic pump with double mechanical seals in an oil bath for higher pressure applications such as double storey homes and irrigation.